Copyright (c) 2009 SpinCore Technologies, Inc. This software is provided 'as-is', without any expressed or implied warranty. In no event will the authors be held liable for any damages arising from the use of this software. Permission is granted to anyone to use this software for any purpose, including commercial applications. Upon launching the program, you will be presented with an interface for writing your PulseBlaster programs. The top white box is an editor. The bottom gray box is output that the interpreter produces. At the bottom of the window is a box to put in the frequency your board uses. On the bottom right, you will notice Line # and Column # output. This tells you where the cursor is inside of the edit box for fixing errors and such. Please note: The frequency value is not interrogated from the board. You must enter the correct clock frequency in this field in order for the board to behave correctly. This frequency will be saved each time you shutdown the program and then reloaded the next time you launch. This button opens a file. You will be prompted to save any changes to the contents of the current file. This button saves the file you are currently editing. This button loads the program that currently resides in the edit box onto the board. The file does not have to be saved beforehand. The program will take the contents of the edit box and interpret them. The output of this operation will be displayed in the output box. Upon success, a message will be displayed saying the board was successfully loaded. If this message is not displayed, it means that some error occurred and a message telling you the error should be the last thing displayed. This button starts execution of the program currently in the board's memory. This button stops execution of the program current in the board's memory. Same as the Open File button. Same as the Save File button. This will exit the program. You will be prompted to save changes to the current file. This turns debug information from the interpreter on and off. This might provide some insight into an error that you might not be able to resolve. The debug information will be shown next time the board is loaded. This saves the contents of the output box to a text file. This clears the contents of the output box. Same as Load Board button. Opens this document in a web browser. This displays information about the program. The language of the interpreter is very similar in appearance to that of an assembly language. Every line represents a single instruction. White space, such as tabs and spaces, is discarded. The language is case-insensitive. The following are instructions on the contents of a given line. This line is labeled Start. Since the language is case insensitive though, the label is equal to any form of the word Start. Labels are optional and do not have to be contained on any line. The output pattern is read until a comma is reached. All white space is thrown away during the read. White space is permitted inside of a time field. The command field is optional. If no command field is listed, the CONTINUE command will be assumed. For more information on these commands see the SpinAPI reference. *Pleae note that WAIT cannot be placed at the top of the program and there should be at least one instruction execution time between the start of the program and WAIT. The data field is also optional unless a branch or jsr command is used during an instruction. In this case, the interpreter forces you to enter a label to jump to. The data field is used for different purposes depending on the command field. If no data field is specified, a value of 0 will be assumed. For more information see the SpinAPI reference. // Valid comment on a line by itself. There are several example programs available. Please take a look at these. This will ensure that all bits are off when program execution stops. This will cause a permanent loop of logical 0 output at the end of the program. Natural Language allows you to specify what bits to switch on for a given instruction. Begin the output field with "0n" and then you can specify which bits to switch on. Valid ranges are 0 thru 23, and each bit is seperated by a '+'. See the examples below. Variables are just replaced with the value they are assigned before program line values are parsed. They can also be changed once they are assigned a value. $output = 0x000000 // $output will be 0x000000 after this point. The return value of the program is 0 if success and -1 if an error occurs. This will result in two 372ns delays being created, thus producing a 744ns total delay. PulseBlaster ESR Pro boards use the upper three bits of the output pattern to determine different aspects about the output pattern. 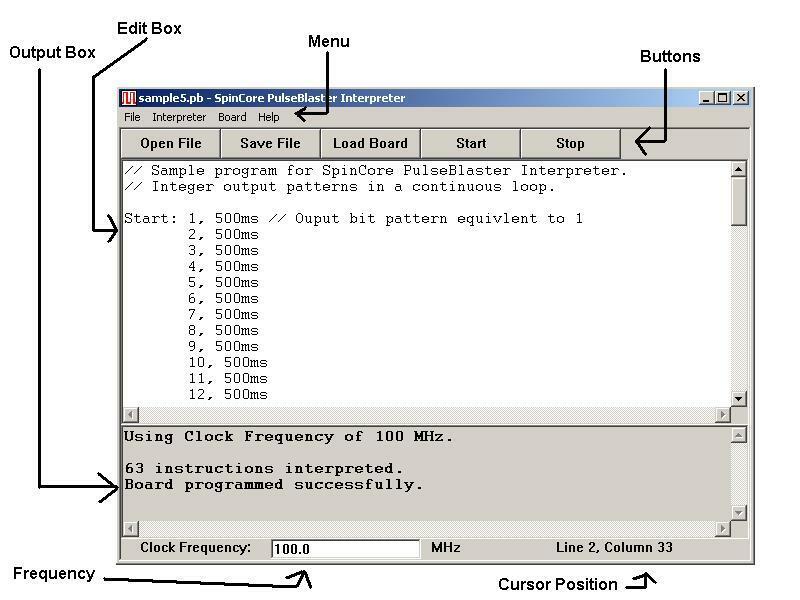 For instance, if the upper three bits of the output pattern are set to 0s, no output pattern will occur during this instruction. An upper three bits of 001 tells the board to perform the output period for 1 period. You see, the board's minimum time value is 12.5 ns. You can use the upper three bits to go lower than this value. 000 - No output pattern. 001 - Output pattern for 1 period. 010 - Output pattern for 2 periods. 011 - Output pattern for 3 periods. 100 - Output pattern for 4 periods. 101 - Output pattern for 5 periods. 110 - Output pattern uses time value. 111 - Output pattern uses time value. 0b 1010 0000 0000 0000 0000 0001, 12.5 ns // Bit 0 will be on for 5 periods. 0b 1000 0000 0000 0000 0000 0010, 12.5 ns // Bit 1 will be on for 4 periods. 0b 1110 0000 0000 0000 0000 0100, 12.5 ns // Bit 2 will be on for 12.5 ns.